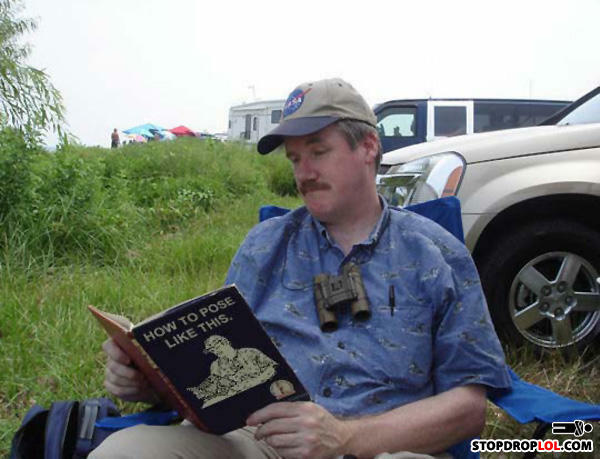 The guy in the background is reading, "How to make it into the picture and still feel a little important even though you weren't supposed to be there"
If the guy in the book is reading "How to Pose Like This," then OMFG paradox. he has mastered the art of the pose. Stave it off. 1, 2, 3 and now you can count to 3. Little do you realize that this is actually a screenshot from a "how-to" video. Dr. Seuss seal of approval. Next they'll have "How to Take a Dump"
One day a there was a guy walking down the street. If you thought this was a joke, you're wrong.